Breakfast sandwiches have been a mystery to me for most of my life. This is mainly due to the fact that they usually involve eggs, and I’ve never been fond of eggs. I started experimenting with them a bit though, after discovering that I do enjoy eggless savory breakfasts. I also really enjoy sandwiches. With those two things in mind, a savory vegan breakfast sandwich was kind of inevitable. I had a loose idea in mind when I made these, and if you read the recipe you might pick up on that. I wasn’t totally sure it would work, but I wanted the tempeh to, at least to some degree, take on the flavor of sausage. Guess what? It worked! Now, I’m not going to go and say you’d fool someone into thinking they were eating sausage with these, but the sausage flavor is definitely there. In fact, I didn’t even mention my sausage-tempeh goal to my husband. Just handed him a sandwich and asked for an honest opinion. I addition to loving the sandwich, he quickly commented that the tempeh had a sausagey flavor. Score! Further proof that you don’t need meat, or even meat substitutes for that matter, to enjoy the flavors we’ve come to associate with it. Another thing about these sandwiches: they are filling! The recipe gives you the option to make two or three sandwiches. I always have this problem with tempeh. Have you read the “number of servings” listed on the nutrition label of a tempeh package? 2.5 servings. Why? This number is terribly inconvenient, and unfortunately, also pretty accurate. I never dine with 2.5 people, so often my tempeh recipes end up giving you a range for the number of servings. In this case, if you stretch your tempeh out and go for the three serving batch, I promise, you will not be hungry. Incidentally, I always seem to wake up famished, so I went with the super-stuffed, two serving recipe. I spent the rest of the day cursing myself, because it was the same day I visited Bethlehem VegFest, so I kinda wished I had more room in my belly. Plan accordingly. Me too! 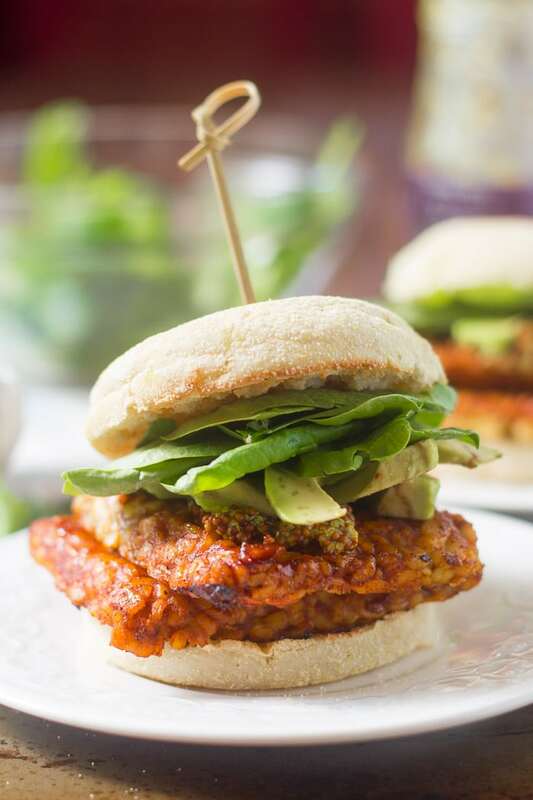 There’s so much you can do with tempeh – love it! Thanks Claudia! You’re killin’ me with that avocado, Alissa. I can practically feel it melting in my mouth. ;) I love the idea of having this sandwich for breakfast! Definitely more filling than my standard bowl of cereal. Avocados can be the worst for photographs – you can never be totally sure what it’s gonna look like on the insdie when you cut it. I got a really good one so I took advantage and played it up to the camera. Oh, and they were soooo filling! My husband loathes tempeh. Do you think that I can make the full recipe, and save half for tomorrow’s breakfast? (Or lunch…) Would the tempeh still taste good, cold? I think it would still be good cold, or reheated. I store leftover tempeh all the time – usually that extra 0.5 servings in a package. ;) Enjoy! This is great. 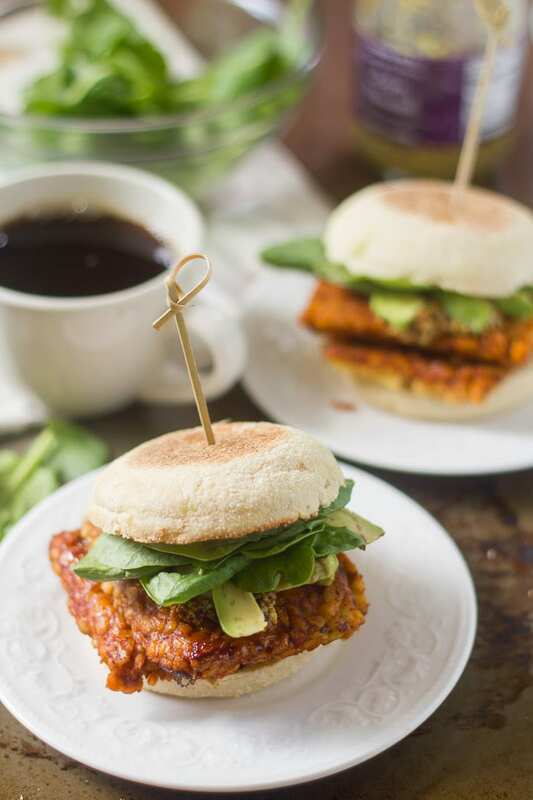 It’s close to what I had for breakfast this morning–sprouted wheat English muffins with avocado and sriracha. I especially like the sprouted wheat English muffins, cause they’re so hearty. I went with the 365 brand whole wheat burger buns rather than an English muffin. I also through a bit of dino kale into the skillet towards the end of the cooking time. I’m going to try this again but with spinach. The burger buns are my go-to for breakfast sandwich making. I cut into three servings and ate two sandwiches. I’m used to drinking a quart of smoothie in the AM, so my appetite is large. You have so many recipes posted lately that are on my to-do list! Kale sounds like a delicious addition! You could really go with all kinds of veggies for this one. :) I’m glad you’re enjoying the recipes! Thanks Glenn! I reheated the third serving last night and added avo and skillet roasted cherry tomatoes with herbs also leftover. Yum! We’ve made this 5 or 6 times now. 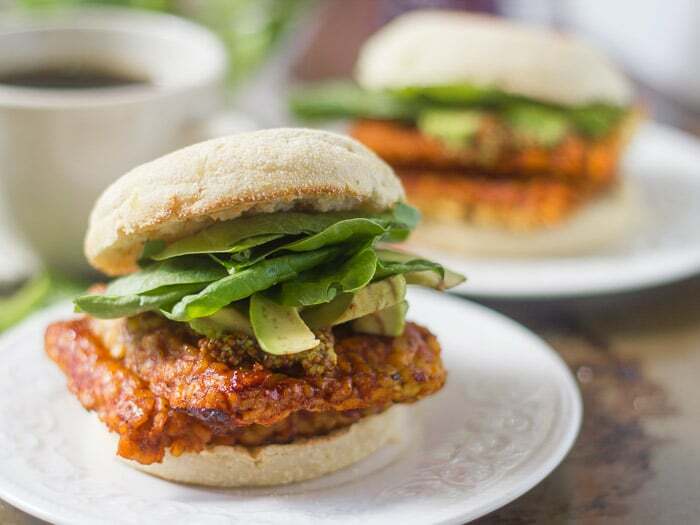 Unquestionably the best vegan savory breakfast we’ve had, and we’ve tried a lot! Yay!! I’m so happy to hear that! Thanks Dave! This was delicious. I had it open-faced on Wasa crisp bread, with a little mayo. Perfect! Sounds like a delicious breakfast! Glad you enjoyed it! 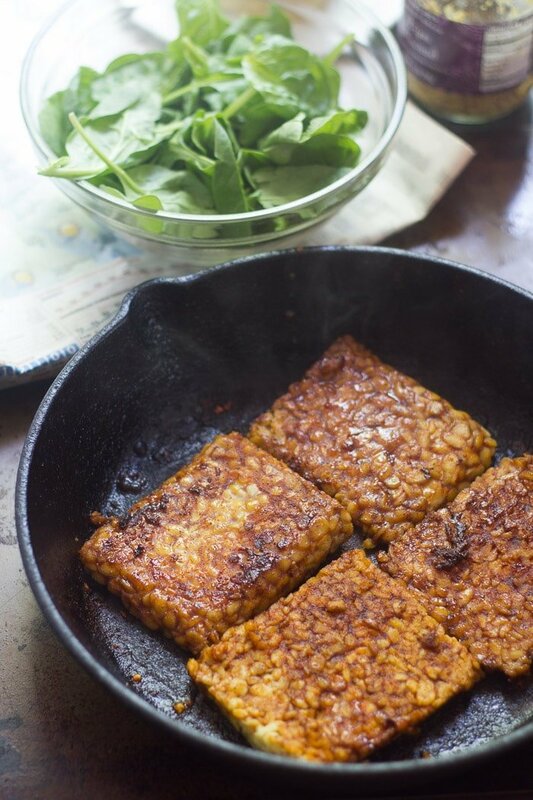 Can you swap the tempeh in this recipe for tofu instead? I am trying to bulk up a very skinny young adult and looking for higher protein vegetarian or vegan options. Can these sandwiches be made ahead and frozen sans the spinach? This young man spends hours in the gym trying to put on some muscle to no avail. According to Men’s Health magazine skinny [vegetarian] guys are simply not consuming enough calories, especially protein. I, the grandmother, would like to make these sandwiches to freeze and give to a grandson. I think that would work fine! Freeze the muffins and tempeh separate if possible, but if not, no big deal. Good luck to you and your grandson! I’m trying this tomorrow. Would this work with seitan? I haven’t tried it with seitan myself, but I think it would work! The only adjustment I can think of that you might need to make is reducing the amount of soy sauce since seitan is much saltier than tempeh. Enjoy!